Donald Trump is not suitable to be the President of one of the most powerful nations on Earth - the United States. The policy of Trump is a deception and has been that from the beginning. He was put in there by the American patriarchs, people like Rockefellers and Bush family. They put Trump in there to prepare America for war, to regain control over the world, because in the last eight years of Obama key alliesone by one were moving towards Russia or moving away from the United States. That wasn't what Washington wanted. When Erdogan made an about-face in May of the last year and the foreign minister Davutoglu, who was the closest ally of NATO, was essentially told to leave, it began to become very critical. The CIA tried and failed with the coup d'états against Erdogan. Therefore, one by one Washington was losing credibility and influence. And the oligarchs, who buy and sell Presidents, Congressmen and Senators, were seeing everything at risk. When China and Russia began cooperation after the US coup d'états in Ukraine that really set alarm bells going, because that wasn't supposed to happen. The Eurasian great powers - Russia, China and Iran made a triangle of cooperation and created this real high-speed infrastructure networks. So, that I think is a nutshell of what's behind the events that led to the bombing in Syria without waiting for a single bit of independent professional investigation of what the "chemical attack" was and who did it. It was made intentionally, because the investigation would show it was all fake. I think that if they will do the investigation, for which Russia was properly calling in the UN Security Council, the investigation would show something very different. There are news clips sent allegedly from the side of the sarin gas attack by Assad's air force. 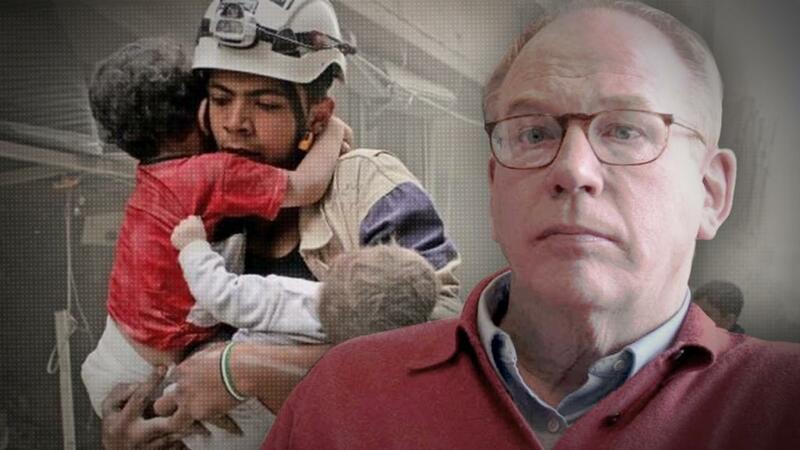 In those clips you have so-called White Helmets, who are reaching down to pickup victims. And you see bare hands! Well, if anybody knows anything about the effect of sarin gas - it's one of the most deadly toxins known to men. Therefore, you would never touch a victim of this gas with bare hands. If you look at the photographs from the 1995 of the Tokyo subway sarin attack, all people who was investigating it had special clothing to avoid direct contact with the victims, this is a very special procedure. So, these White Helmets who allegedly tried to save victims in Syria - all fake. Nikky Haley at the UN Security Council held up pictures, but we don't know where those pictures were taken. There is another video that claims to be of the young child who was "killed" in the bombing attack. But the video was a little bit careless-made, because we can see how a little girl opens her eye to see if it is over. They didn't watch carefully enough to see that, so that is now on the Internet. Doctor, who allegedly treated the victims has time to tweet to the world that "there are so many victims, I don't know what to do..." and so on. If you're a doctor in the emergency situation you concern with the patients, you're not tweeting what is going on in the hospital or giving videos. This is all fakery. And it's designed to create the incident for the excuse to bomb Syria. Now, Trump looks like a Commander-in-Chief of the Armed Forces of the United States of America. I would say, this is a highly dangerous situation.